Do you ever feel like you don’t want to spend hours sweating in the kitchen after a whole day at work? I do, not only because I want to put my feet up and relax, but also because I don’t want to eat later than 9pm. Work life and healthy diet aren’t easily balanced, but that’s when delicious and easy, not to say quick recipes come in handy. 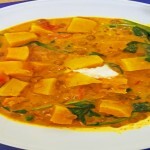 Enter butternut squash dhansak. After the Christmas break Ben and I felt we needed to eat something healthy and not heavy. We usually don’t overeat and are more often than not quite health conscious, but I guess Christmas is tough on everyone. Who can say no to delicious and succulent turkey, crunchy roast potatoes, not to even think about mince pies and loads of cream. Yes, I love cream. Any type of cream. This Christmas was especially hectic. We had a pre-Christmas event with the English side of the family, which saw me preparing the traditional English meal for the first time. Yes, you got it, everything from prawn cocktail to pigs in blankets and of course turkey. I’m lucky as Ben is quite willing to help in the kitchen (if he’s allowed to), so I left the prawns in his capable hands, while I wrestled with the massive bird. We also ended up having about 4 different types of desserts, from traditional Slovenia potica (remember the Great British Bake Off technical challenge?) to mince pies, Christmas pudding and raspberry chocolate cake – most of them were also gluten-free. And then we had a Slovenian Christmas with more potica, goose, mlinci, red cabbage and an abundance of other food. After that we were ready to stop eating for a while. 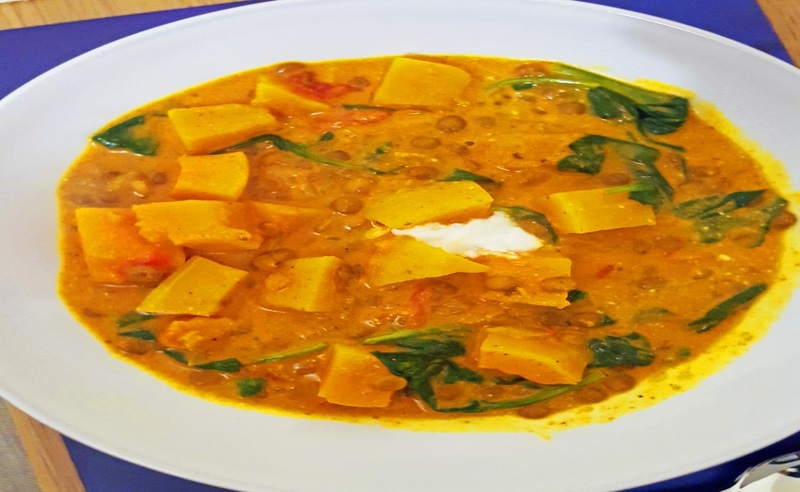 So as soon as the New Year kicked in, we embarked on a healthy diet and the butternut squash dhansak was one of the first dishes on the menu. Let me know what you create in your kitchens after Christmas. And I promise I’ll post more recipes soon. Delicious vegetarian butternut squash dhansak with lentils and coconut milk. A nutritious and easy recipe for a weekday meal. Peel and cut the buttetnut squash into bitesize chunks. Place in microwave safe bowl, add a splash of water and cover with clingfilm. Microwave for 10 minutes or until the butternut squash is tender. Meanwhile, chop the onion, heat the frying pan, add the oil and cook the onion until softened. Make sure it doesn't turn brown. Add the curry paste, stir and cook for 2 to 3 minutes. Add tomatoes and coconut milk and let simmer for 10 minutes or until the sauce thickens a bit. Drain the butternut squash and the can of green lentils and add to the sauce. Cook for up to 3 minutes, so the lentils warm through. Add the spinach and cook for 2 to 3 minutes, until spinach wilts. Stir in the coconut yoghurt. Plate and add a dollop of coconut yoghurt on top. Serve with a warm naan bread or rice. I used plain yoghurt made out of coconut milk and it was delicious.